Below, we’ve outlined your parking options for both LA area ports. When sailing for the Port of Los Angeles, your options are somewhat limited. With a major working port on one side and residential neighborhoods on the other, there isn’t a lot of space for independent parking lots like at other ports around the country. That said, the port offers parking right on site. There are plenty of spots and reservations are not required. Rates are $17 per day for regular vehicles, $32 for oversized vehicles. So for a week-long cruise, expect to pay $119 for parking. That may seem expensive, but it’s relatively affordable for parking compared to other major cruise ports around the country. Cash or credit card are accepted, and you pay after your trip. While there aren’t abundant options for independent parking lots, there is one place that will offer cheap parking for cruiser — hotels. Several hotels in the area cater to cruise passengers. They will offer discounted parking if you stay with them for at least one night. We have a list of participating hotels here. In general, if you plan to stay in the LA area for an extra night or two anyway, we highly recommend using this tip to save some cash on your parking. Like the Port of Los Angeles, you won’t have many options for parking other than the official port parking at the terminal. Still, it’s hard to complain when parking is a mere steps away from the terminal, meaning you don’t have to deal with long walks or wait on shuttles to take you back and forth from your ship. As you can see in the map below, the parking garage is extremely close to the terminal. Parking rates are $19 per day. So if you have a week-long cruise, expect to pay $133. Cash and credit cards are accepted. The lot doesn’t require reservations — there should be plenty of parking come cruise day. If you have an oversized vehicle, you’ll be charged for the number of spots your automobile takes up (there are also outdoor spots if your vehicle is too tall). 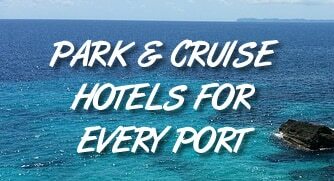 Again, if you plan to stay in the area and want to save on parking, be sure to check out our list of hotels offering cruise parking packages.